On the west side of the new extension is a space approximately 1.5 meters wide between the extension and the boundary fence. Further up this long narrow space is our Siddons heat pump hot water service. The downpipes from the new roof and half the old house come down at this point also. An ideal place to put some space saver water tanks. The idea was to link these to the laundry, washing machine and new toilet to conserve mains water. Research on the interweb soon found that on the mainland reasonably sized narrow, tall water tanks were easily available from a variety of sources. Here in Tasmania it was a slightly different story. There were 1000 litre tanks available as a slimline from most manufacturers but bigger than this the choices were much narrower. The choice really only came down to one company Tankworld in Kings Meadows, Launceston. They had a 2500L or a 3000L slimline made by Nylex that would fit perfectly. In fact two 3oooL tanks would fit. After talking with Tankworld they recommended a flat firm surface, preferably concrete. Our problem was that under the ground runs a sewer pipe and a stormwater pipe and I really wanted to keep them accessible f possible with out having to dig up concrete. The answer to purchase a number of large concrete slabs 900mm x 450mm that are normally used for putting hotwater services or gas cylinders. Thirteen of these were laid on top of crusher dust. 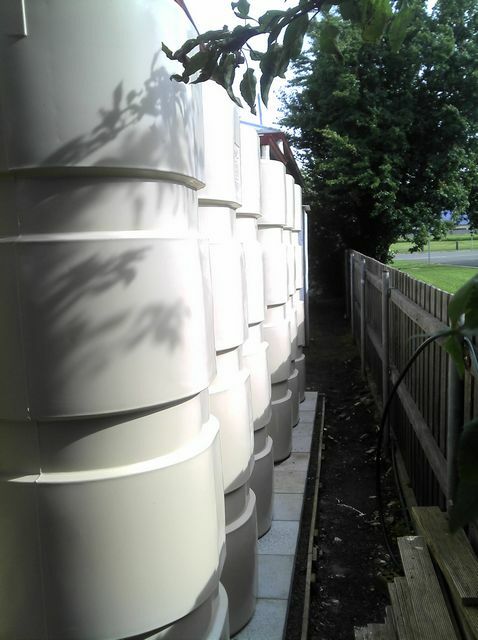 We ordered the tanks, removed a section of fence to get them in and voila water storage. In the meantime research was done on what type of pump to use. There are a number of devices that have the tank water enter one side and the mains pressure water the other. When it senses the tank water getting low it automatically swithces to mains pressure until the tank fills again. 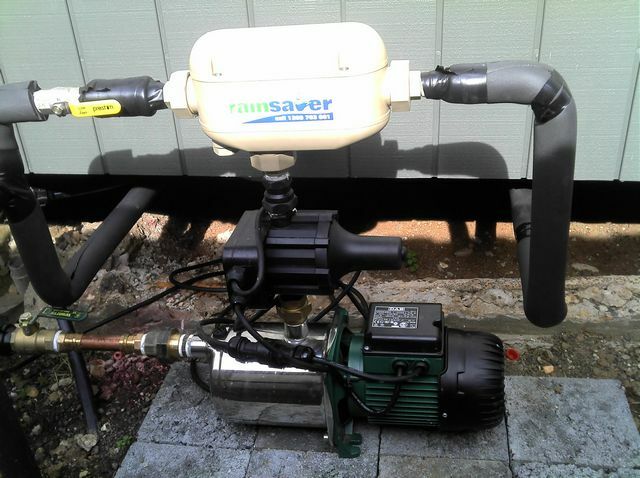 Some of the companies that provide these are Davey (Rainbank), Onga (water switch), and Bianco (rain saver). We decided on the Bianco which comes as a package with a DAB pump which is a 577kpa 120lpm pump with a 2 year warranty on the pump and a 4 year warranty on the Rainsaver. It was purchased from The Pump Shop in Prospect. Now we had all the ingredients the hard part was finding a plumber that was willing to fit it all. 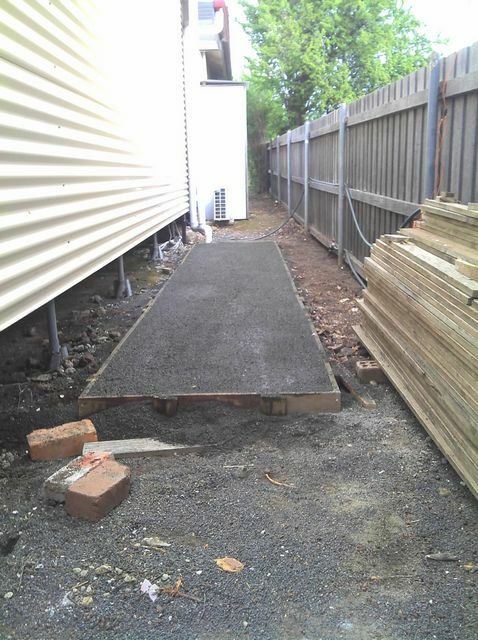 Eventually we found Steve who did a fantastic job of laying a new line into the laundry, and to the garden taps, and plumbing all the tanks in and the stormwater in and out the overflows. 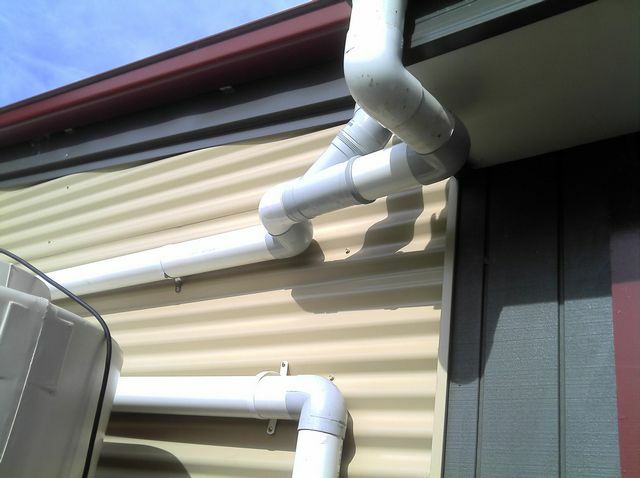 When we had the plumbing inspected by Meander Valley Council the officer remarked on the thorough job that had been done. 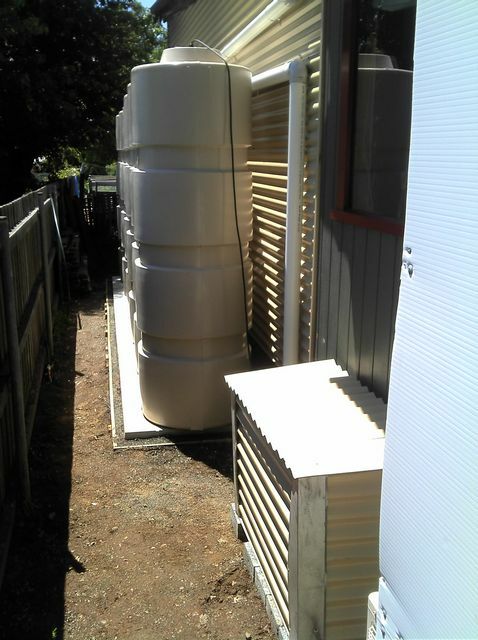 Now when we flush the loo or water the garden we know that it is coming from the tanks and not the mains unless of course we run dry which is unlikely in Tassie. I built a pump cover from left over Sandbank Colorbond and treated pine from the old deck. There are still first flush diverters and a pressure tank to fit. The pressure tank will help cut down the amount of time that the pump runs and thus wera and tear and electricity. Reblogged this on A green Tasmanian renovation.